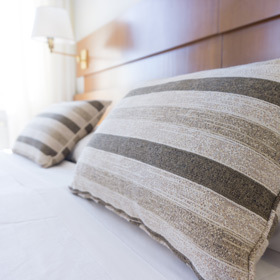 Walk-on Dust has been supplying fresh linen to many satisfied customers from a variety of businesses such as hotels, restaurants and healthcare facilities. This rental service will take care of your worries about getting your linen cleaned. You do not need to purchase or replace worn linen, you simply rent it from us. We deliver clean linen right to your door and pick up the used ones for laundering, so you will always have a clean supply of fresh linen on hand. Supply, laundering and maintenance of your linen, with no upfront capital investment, can be easy with Walk-on Dust! Proudly providing rental linen services in Dunnville, Haldimand County, Hamilton, Burlington, Oakville, Niagara, Brantford and surrounding Regions. Please give us a call at 1.800.263.DUST (3878) to find out more about this service!